(PhysOrg.com) -- Challenging conventional wisdom, new research finds that the number of sunspots provides an incomplete measure of changes in the Sun's impact on Earth over the course of the 11-year solar cycle. The study, led by scientists at the National Center for Atmospheric Research (NCAR) and the University of Michigan, finds that Earth was bombarded last year with high levels of solar energy at a time when the Sun was in an unusually quiet phase and sunspots had virtually disappeared. "The Sun continues to surprise us," says lead author Sarah Gibson of NCAR's High Altitude Observatory. "The solar wind can hit Earth like a fire hose even when there are virtually no sunspots." The study, also written by scientists at NOAA and NASA, is being published today in the Journal of Geophysical Research. It was funded by NASA and by the National Science Foundation, NCAR's sponsor. Scientists for centuries have used sunspots, which are areas of concentrated magnetic fields that appear as dark patches on the solar surface, to determine the approximately 11-year solar cycle. At solar maximum, the number of sunspots peaks. During this time, intense solar flares occur daily and geomagnetic storms frequently buffet Earth, knocking out satellites and disrupting communications networks. Gibson and her colleagues focused instead on another process by which the Sun discharges energy. The team analyzed high-speed streams within the solar wind that carry turbulent magnetic fields out into the solar system. When those streams blow by Earth, they intensify the energy of the planet's outer radiation belt. This can create serious hazards for weather, navigation, and communications satellites that travel at high altitudes within the outer radiation belts, while also threatening astronauts in the International Space Station. Auroral storms light up the night sky repeatedly at high latitudes as the streams move past, driving mega-ampere electrical currents about 75 miles above Earth's surface. All that energy heats and expands the upper atmosphere. This expansion pushes denser air higher, slowing down satellites and causing them to drop to lower altitudes. Scientists previously thought that the streams largely disappeared as the solar cycle approached minimum. But when the study team compared measurements within the current solar minimum interval, taken in 2008, with measurements of the last solar minimum in 1996, they found that Earth in 2008 was continuing to resonate with the effects of the streams. Although the current solar minimum has fewer sunspots than any minimum in 75 years, the Sun's effect on Earth's outer radiation belt, as measured by electron fluxes, was more than three times greater last year than in 1996. Gibson said that observations this year show that the winds have finally slowed, almost two years after sunspots reached the levels of last cycle's minimum. The authors note that more research is needed to understand the impacts of these high-speed streams on the planet. The study raises questions about how the streams might have affected Earth in the past when the Sun went through extended periods of low sunspot activity, such as a period known as the Maunder minimum that lasted from about 1645 to 1715. "The fact that Earth can continue to ring with solar energy has implications for satellites and sensitive technological systems," Gibson says. "This will keep scientists busy bringing all the pieces together." 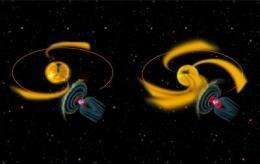 For the new study, the scientists analyzed information gathered from an array of space- and ground-based instruments during two international scientific projects: the Whole Sun Month in the late summer of 1996 and the Whole Heliosphere Interval in the early spring of 2008. The solar cycle was at a minimal stage during both the study periods, with few sunspots in 1996 and even fewer in 2008. The team found that strong, long, and recurring high-speed streams of charged particles buffeted Earth in 2008. In contrast, Earth encountered weaker and more sporadic streams in 1996. As a result, the planet was more affected by the Sun in 2008 than in 1996, as measured by such variables as the strength of electron fluxes in the outer radiation belt, the velocity of the solar wind in the vicinity of Earth, and the periodic behavior of auroras (the Northern and Southern Lights) as they responded to repeated high-speed streams. The prevalence of high-speed streams during this solar minimum appears to be related to the current structure of the Sun. As sunspots became less common over the last few years, large coronal holes lingered in the surface of the Sun near its equator. The high-speed streams that blow out of those holes engulfed Earth during 55 percent of the study period in 2008, compared to 31 percent of the study period in 1996. A single stream of charged particles can last for as long as 7 to 10 days. At their peak, the accumulated impact of the streams during one year can inject as much energy into Earth's environment as massive eruptions from the Sun's surface can during a year at the peak of a solar cycle, says co-author Janet Kozyra of the University of Michigan. The streams strike Earth periodically, spraying out in full force like water from a fire hose as the Sun revolves. 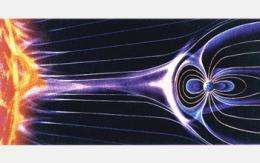 When the magnetic fields in the solar winds point in a direction opposite to the magnetic lines in Earth's magnetosphere, they have their strongest effect. The strength and speed of the magnetic fields in the high-speed streams can also affect Earth's response. The authors speculate that the high number of low-latitude coronal holes during this solar minimum may be related to a weakness in the Sun's overall magnetic field. The Sun in 2008 had smaller polar coronal holes than in 1996, but high-speed streams that escape from the Sun's poles do not travel in the direction of Earth. "The Sun-Earth interaction is complex, and we haven't yet discovered all the consequences for the Earth's environment of the unusual solar winds this cycle," Kozyra says. "The intensity of magnetic activity at Earth in this extremely quiet solar minimum surprised us all. The new observations from last year are changing our understanding of how solar quiet intervals affect the Earth and how and why this might change from cycle to cycle." More information: If the Sun is so quiet, why is the Earth ringing? A comparison of two solar minimum intervals. Authors: Sarah Gibson, Janet Kozyra, Giuliana de Toma, Barbara Emory, Terry Onsager, and Barbara Thompson. Publication: Journal of Geophysical Research. A prime time for SPSS and space fountain systems, or the exponential desertification of the earth depending on what defenses are employed, hopefully not ICBM's and Killer drones. The _Sun_ suprises us? How about Proxima Centauri? Betegeuse? Sirius? Any QuaSAR?